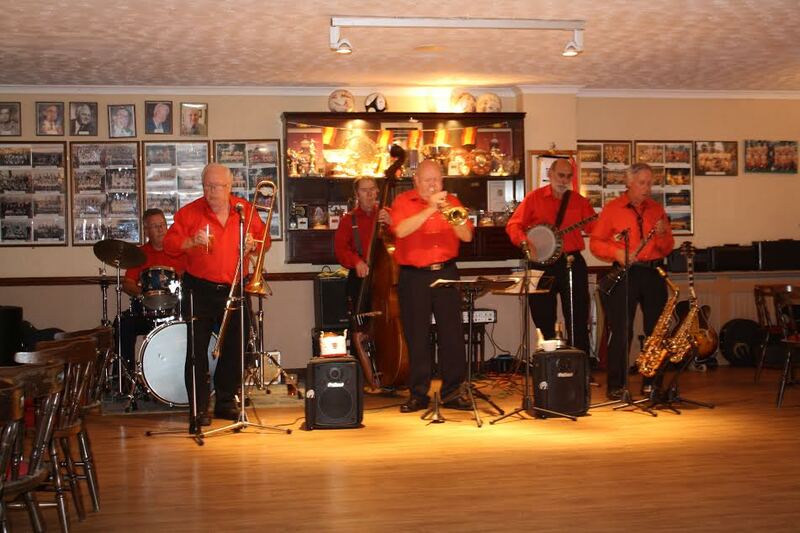 ‘BILL PHELAN’S MUSKRAT RAMBLERS’ provided our entertainment at FARNBOROUGH JAZZ CLUB on Friday, 3rd October 2014. 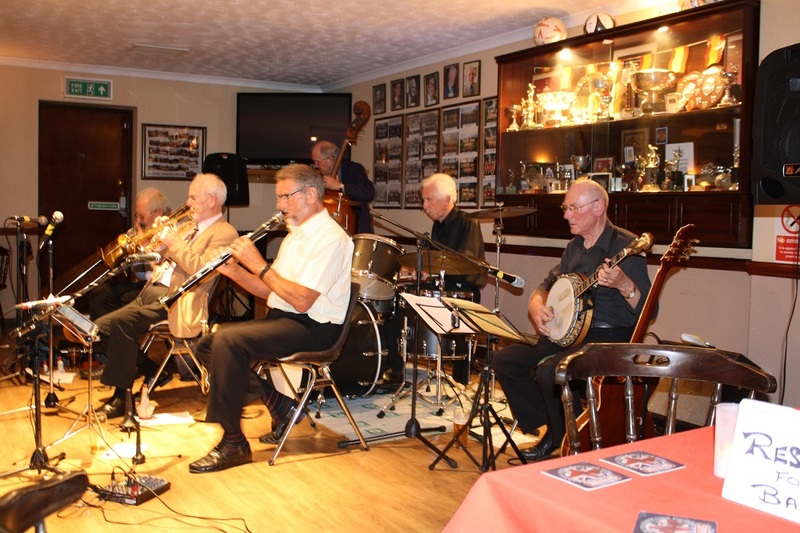 The musicians with band leader BILL PHELAN (trumpet & flugabone) were ALAN CRESSWELL (clarinet), JOHN HOWLETT (trombone), ANDY LAWRENCE (double bass), JOHNNY MCCALLUM (banjo), plus PAUL NORMAN (drums). This happy band has been a big favourite with you on previous appearances and once again, they maintained that popularity contest. Lovely to see the party of ten new people arrive, brought by a couple who visited us a few weeks ago. We’d love to see you again, you are great dancers. The band usually starts off with their signature tune, but for a change, they decided to play ‘Royal Garden Blues’, an equally happy number. The next number I wish to mention is ‘See See (or CC) Rider’. It was the number to bring out plenty of dancers. 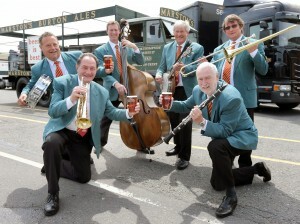 ‘Bugle Boy March’ followed on and was another great tune to dance to. Bill Phelan’s Muskrat-Ramblers, featuring Alan Cresswell playing ‘Petite Fleur’ at the Farnborough Jazz Club, Kent. 3rd October 2014. Photo by Mike Witt. Alan was featured next, playing his wonderful rendition of ‘Petite Fleur’, what a player. They finished the first section with a brilliant performance of ‘Hiawatha Rag’. I was glad they chose to do ‘Ciribiribin’ again, (see my notes about their gig with us on 15 November 2013), because they do play it with great feeling and what about ‘Bourbon Street Parade’! It was sung by Johnny and is such a grand number, bringing smiles to everyone’s faces. A must to mention is Bill’s feature on flugabone, namely ‘Star Dust’, so melodic. Bill plays it how it should be done, beautifully (sorry not to have a picture of him too). It is so difficult to decide to cut out numbers that have been played so well, but my last choice is ‘Canal Street Blues’. I’m sure they were playing over time, we were all enjoying ourselves I didn’t notice the time and no-one wants to end a happy evening. The number is such a jaunty one, we were all up dancing, so ending on a high. 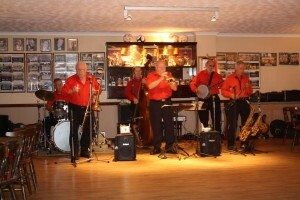 Bill Phelan’s Muscrat Ramblers at the Farnborough Jazz Club, Kent. 3rd October 2014. 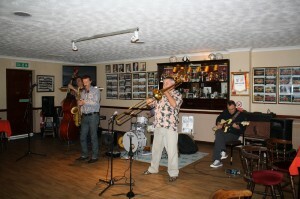 Bill Phelan’s Muskrat Ramblers, again featuring Alan Cresswell at Farnborough Jazz Club, Kent. 3rd October 2014. Photo by Mike Witt. Thanks again guys for entertaining us. Next Friday’s band is Les Hanscomb’s Tailgate Jazz Band, so see you all then. Trad jazz – always fun – keep it ‘Live’. This entry was posted in Bill Phelan's Muscrat Ramblers on September 30, 2014 by Diane. 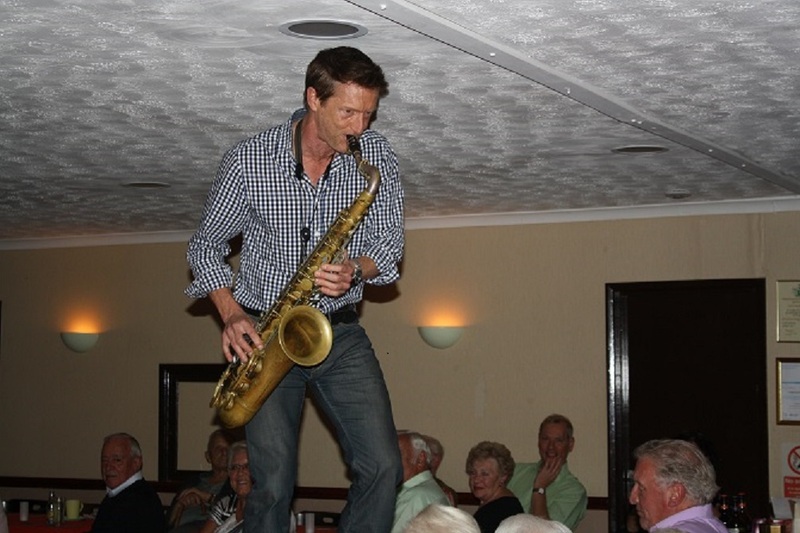 MIKE BARRY’S XXL JAZZ BAND made our audience really pleased to be here at our Farnborough Jazz Club in Kent on Friday, 26th September 2014. Leader and trumpeter Mike’s band consisted of reeds player GOFF DUBBER, trombonist REX O’DELL, banjo & guitarist JOHN STUART, double bassist ROGER CURPHEY and drummer PAUL BUDD. It was lovely to see them all again. 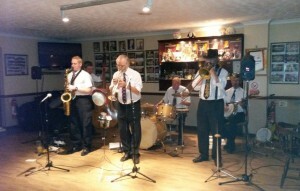 Mike Barry’s XXL Jazz Band at Farnborough Jazz Club, 26th September 2014. 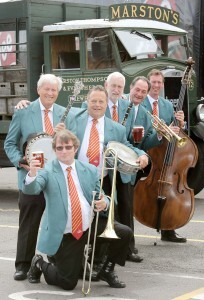 MIKE BARRY (trumpet), GOFF DUBBER (reeds), REX O’DELL (trombone), JOHN STUART (banjo & guitar), ROGER CURPHEY (double bass) and PAUL BUDD (drums). To start with, there was plenty of laughing coming from the band BEFORE you (our audience) all arrived, always a good sign they will enjoy entertaining you. They chose a great number to begin with, being (amongst many top stars) Johnnie Ray’s big hit ‘Alexander’s Ragtime Band’. Rex, who has a super voice, sang it and of course lots of us joined in, knowing most of the words. ‘Beale Street Mama’ had a couple of superb solos, one from John on guitar, plus Roger on double bass. Continuing with my next choice, which was ‘When The Midnight Choo Choo Leaves For Alabam’. This was also sung by Rex, to which several of us chose to do our line-dance. 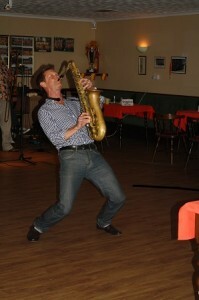 I’m not sure if our bands enjoy us doing it, nor our audience, but we enjoy do the dancing – ha! Next number Mike Witt (who took this super photo) emailed to me, and I quote “It was good to hear Mike Barry’s vocal rendition of “Marching through Georgia”, which is often played by bands of all types, from military through to Trad jazz but which is rarely sung. It commemorates General Sherman’s troops’ epic march through the US state of Georgia during the American Civil War, during which the city of Atlanta was burned”. He continued “Then followed civilian casualties and damage to property as Sherman’s men foraged the local land for food and supplies. Perhaps that’s why it is not often sung publicly, especially in the American south where even whistling the tune can result in a punch-up. Resentment still burns hot there!” Quite a statement, that I had to include it in this newsletter. Mike (B) sang it, with the rest of the band ‘Ahh, Ahhing’ along too. Plenty of dancers out for this one. After a break, they continued with an old favourite of trad jazz lovers, ‘Dr Jazz’, sung by Goff. 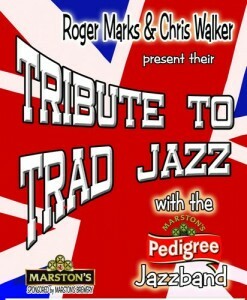 It’s amazing how many talented jazz singing musicians there are within the Trad’ world. John took to the guitar for ‘Brown Skin Girls’, again plenty of dancers. Obviously, ‘Ice Cream’ is another bigtime favourite. What they did with their rendition, was to interject with that tune ‘Good Morning’ (from the film ‘Singing In The Rain’) – fabulous. I recall Paul giving a terrific drum solo. Then came a brilliant situation of the evening, when they played overtime on the first section, which was fine. But when they began to do the same with their second break, I called out (so we could do the raffle draw). However, Mike called back “what’s up, we have another three hours to go!” So when it came to the end of the evening and it was all over, I took the ‘mike’ and said “hey, you have another couple of hours to go!” (Then to the audience) “You all witnessed Mike saying they had three hours to do”. It’s marvellous that a band enjoys themselves, so much they do not want to end – just as much as we love listening to their wonderful talent. 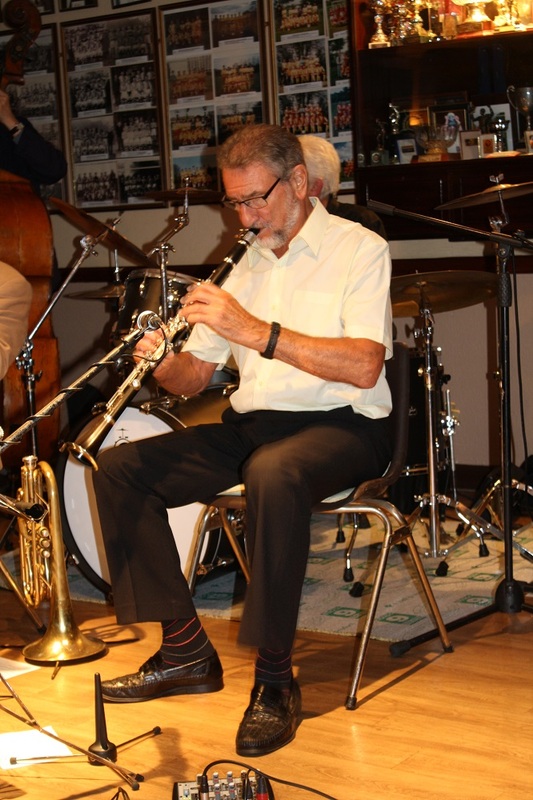 Colin Dobson, well known on trumpet with the Billy “Wakey, Wakey” Cotton band and a jazz legend in his own right, is a regular visitor to Farnborough Jazz Club where his opinions are often sought by other trumpet virtuosos with regard to their performances. 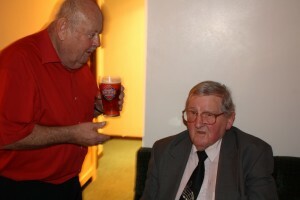 Here Mike Barry, trumpet man with his own XXL band, discusses technical points with Colin over a friendly pint of Spitfire bitter. Photo by Mike Witt. 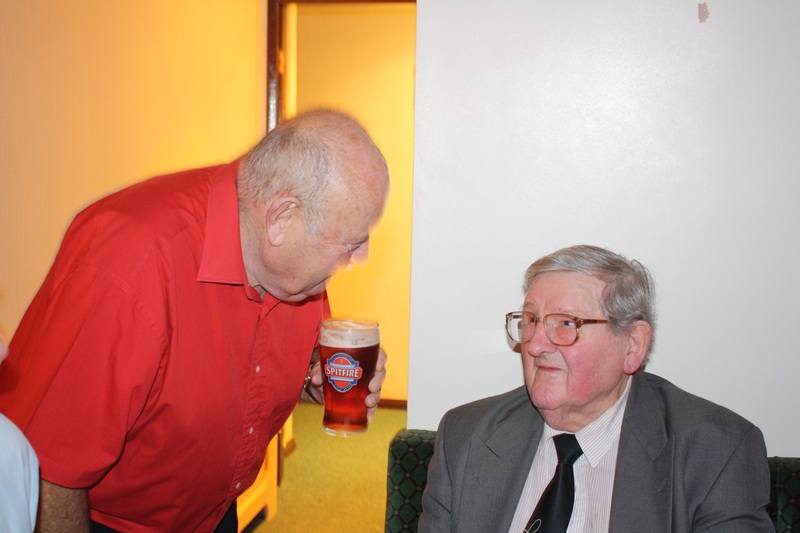 Now, I have often mentioned we have the delight of receiving in our audience, Colin Dobson (well known on trumpet with ‘Billy Cotton’s Band’ for many years). Colin Dobson (well known on trumpet with Billy “Wakey, Wakey” Cotton Band) talking to Mike Barry (left) at Farnborough Jazz Club. This evening, Colin was accompanied by his delightful wife, Jo, and lovely family. I loved it that Mike Witt captured these two photos for our website. This entry was posted in Mike Barry’s XXL Band on September 22, 2014 by Diane. 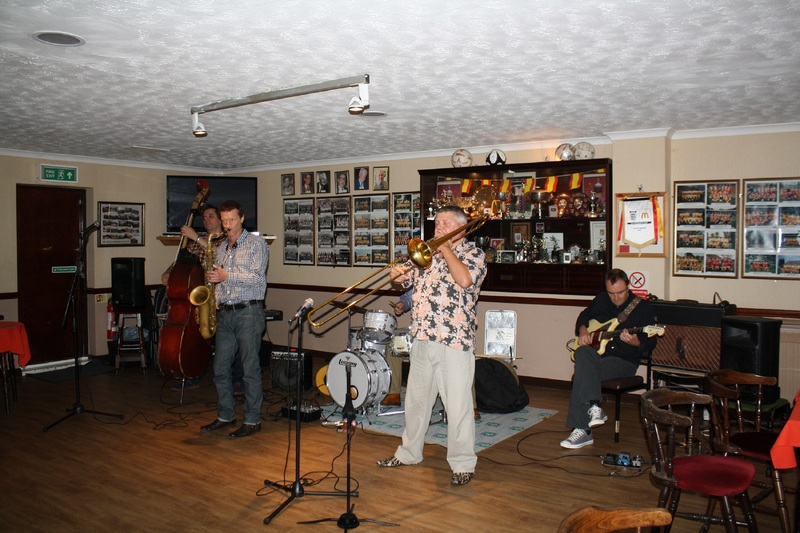 ‘MARTYN BROTHERS JAZZ BAND’ once again,were fabulous when they played for us on Friday, 5th September 2014, here at our Farnborough Jazz Club. As mentioned before, co-leaders, Emile and Ben, are the sons of that wonderfully flamboyant drummer and band leader, Barry Martyn. 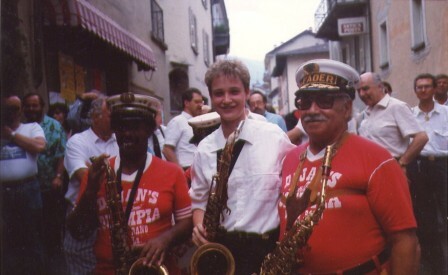 Barry moved to New Orleans many years ago, so Emile and Ben were brought up there. BEN MARTYN plays double bass and EMILE MARTYN plays drums (both sing). 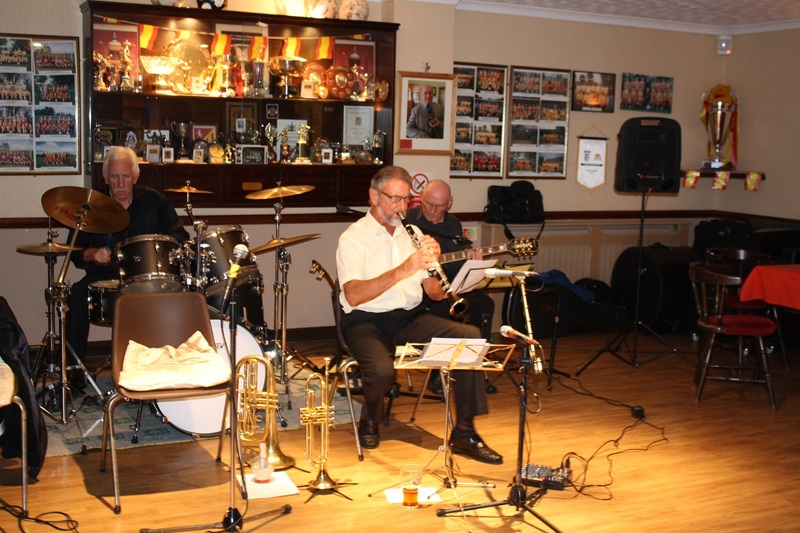 They were joined by JULIAN WEBSTER GREAVES on sax, harmonica & vocals, JEFF WILLIAMS on trombone & vocals, JOHN ‘radio’ RUSCOE on guitar and HENRI HERBERT on piano (I said last week, Henri is an exciting boogie woogie player and is new to our club). It was a brilliant evening with their unique style of jazz, combining certainly New Orleans, a little bit of 60’s and a little bit of ‘country’, very entertaining. One of our regular visitors, Mike Witt, took these wonderful photos, which shows just how they ‘delivered’ (shame the ‘band’ one misses Emile and Henri and only got Ben’s head, but thanks a mill’ Mike, for taking the photos). Oh again, how I wished we had filmed some of the evening. I have so much going on in my private life and if things were normal, we would have booked someone regularly to film for us. But there you go, disappointingly we haven’t. So here’s how the evening went, although as usual, I’m finding it so difficult to pick out the numbers to tell you about, as all were good. I have by-passed some great numbers (as they were played by other bands recently) and move forward to mention they played ‘Statesboro Blues’. Julian was on harmonica and also sang and what a number. Julian is another extremely talented musician. Henri was to feature next with ‘Sweet Lorraine’. I’m not sure how old he is (he seemed very unassuming), but boy, oh boy, can he play the ivories – he certainly has a voice there! ‘Pennies From Heaven’ followed next, with Jeff’s great singing, then Ben joined in singing in a high pitch. I’m sure he has been having lessons from his 10mth-old baby (Lorelai) great fun Ben. The number to come next was a rip roaring number ‘Oh Marie’, to which Emile lent his vocalisation to (yep, he also has a great voice). The pièce de résistance was Julian playing sax, whilst moving all around the club, up on the table (see photo for evidence) and then sitting on Susan’ lap (sorry Susan, no photo), definitely one of the highlights of the evening. See photos for evidence!! 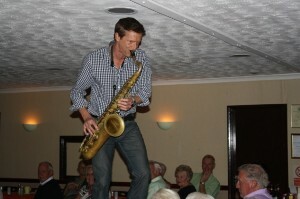 Julian Webster Greaves in action at Farnborough Jazz Club, Kent, 5th September 2014, with Martyn Brothers Jazz Band. Another popular song ‘St. Louis Blues’ lured the dancers out on the floor (I recall they mixed a bit of Glen Miller’s ‘Pennsylvania 6500’). Then before the dancers could return to their seats, with Ben singing, they played ‘You Never Can Tell (C’est La Vie)’ and so were lured back to dance some more. Would you believe it, the same happening with ‘Honest I do’. I’m sure you were all exhausted, but exhilarated. Ben sang again – he has a marvellous voice and it is obvious from my description, the band played (without a break) as a marathon! What followed sounded like a big band when playing ‘Lester Leaps In’. Emile performed a marvellous drum solo (although I called out ‘Keep practising Emile’ – joking of course). Henri gave us a fabulous exhibition of his own composition ‘Henri’s Blues’ (see there’s where we needed to film), thank you Henri. [Since writing these words, I asked Ben what year did he write it and have just learnt Henri wrote it that evening – now that’s talent. We will have to have a copy of the song on our website, when he records it.] ‘Folsom Prison Blues’ (surely chosen, being eleven years to the day of Johnny Cash’s death) came next. I danced with Gordon and am sure I lost a few pounds of fat. An explosive number. Julian played harmonica and sang next. His American lady friend came to hear the band, so they played this one, ‘Route 66’, to make her feel at home. I don’t think there are many people who dislikes hearing that number either, especially how they perform it. They began the second set with ‘The Sheik of Arabi’ sung by Ben. We chose to do our line dancing. Marie-Ann and Susan were doing something different to the rest of us and Ben asked me ‘aren’t you suppose to do the same thing’. I told him they were already on ‘the advanced course’, ha. Well, I was unable to choose any fewer numbers (sorry boys, to give too much away for your other gigs). What another ‘wow’ session. Cannot lose this club, can we. 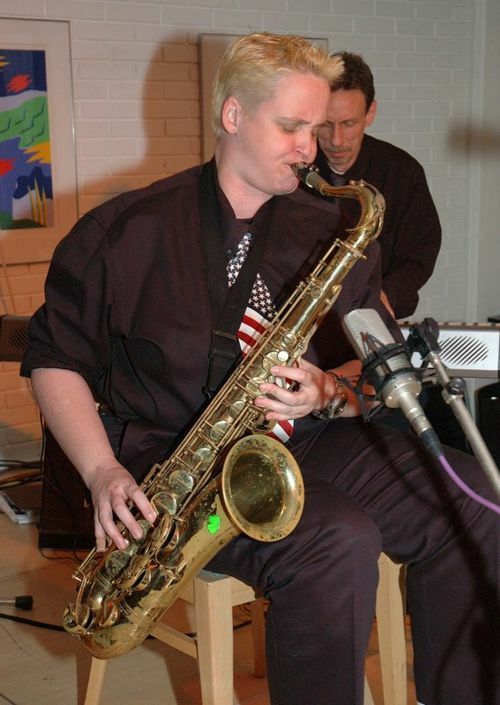 This entry was posted in Martyn Brothers Jazz Band on September 8, 2014 by Diane.